Alibaba Group Holding Ltd., while investing in new areas such as financial, retail and computing services. “Tencent needs to invest in new business, it would help the company build a better ecosystem infrastructure to support growth, but it will hurt margins in the short term,” said Benjamin Wu, an analyst at Shanghai-based consultancy Pacific Epoch. Sea Ltd., Sogou Inc. and Yixin Group Ltd. Those are just three of the 600 companies the company has invested in. Quarterly revenue rose 51 percent to 66.4 billion yuan but fell short of projections for 68.6 billion yuan. best-performers over the past decade. Revenue from the Value Added Services unit, which includes online games and messaging, climbed 37 percent but online advertising sales surged a much-quicker 49 percent. Costs however soared 72 percent, reflecting the expense of acquiring video and music content to keep users hooked as well as investment in new businesses such as cloud computing. Executives told reporters on Wednesday that spending was crucial to the longer term. mainland exchange would be considered if policy conditions are viable. After striking gold with Honour of Kings, Tencent developed two mobile versions of PlayerUnknown’s Battlegrounds, the world’s hottest personal computer title last year. Since their January debut in China, the pair have given Tencent a much-needed boost in momentum, attracting more than 80 million players, combined. The company is still in talks with regulators to introduce a desktop version of PUBG. Honour of Kings remains a staple for Tencent. Developed in-house, the mobile hack-and-slash title loosely resembles the world’s most popular desktop game — League of Legends, whose developer Riot Games Tencent acquired in 2015. 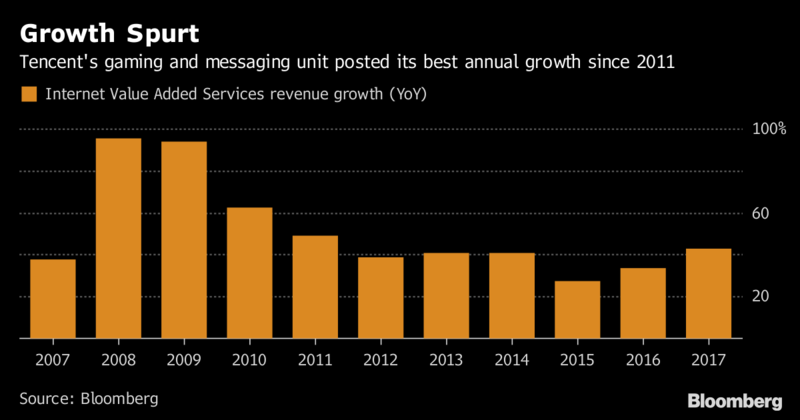 But Tencent is also moving swiftly into areas such as financial services, aiming to compete more directly with Ant Financial, the Alibaba affiliate that’s dominated payments for years. Tencent’s payments services was now No. 1 in China when measured by daily or monthly active users, Lau said. Its Licaitong wealth-management service harbored more than 300 billion yuan in assets as of January, while Weilidai — its nascent lending business — had outstanding loans of more than 100 billion yuan at the end of 2017. “We are substantially increasing our investment in areas including video, payment, cloud, AI technologies and smart retail,” Ma, who is also known as Pony, said in an emailed statement.